Contributor Brooks Paternotte with a St. Paul’s trophy Atlantic salmon is much saddened by the Miramichi disaster. Paternote photo. You may never again read about a famous place called Miramichi. It wanted to be celebrated this year just like it had been since the 1880s, but disaster stuck like lightning. Now, decades so storied that the Miramichi was annually frequented for its seasonal treasure by the world’s noblemen, artists, captains of industry, movie stars, sports figures, writers, and the poor and rich. Man, unchecked and heedless because of headless leadership has worked his magic and hastened climate change, a natural event, with such acceleration that natures elixirs have had no time to adjust, so we suffer one catastrophe after another. Extincting one fauna and flora at a time, watching fires turn humans and property into infernos, storms flood so devastatingly that there are no longer boundaries. Striped Bass, its furthest northern reach was a show up in Maine, then more pronounced in Massachusetts, Rhode Island, Connecticut – south to the Carolinas until dams in the 1940s created a new terminus – Chesapeake Bay. Now that is threatened by deleting from its diet menhaden, a forage fish rich in omega 3 — a simple and irresponsible allowance to overharvest Atlantic Brevoortia tyrannus by powers gone mad. Three friends of mine were on the Northwest Miramichi at the beginning of August. They fished for five days and did not see an Atlantic salmon. Not an adult fish, a grilse, or a parr. For five days on a storied Atlantic salmon branch of the Miramichi they cast in vain. What they did see were hundreds of striped bass – in pools thirty to forty miles inland, pools normally the realm of Atlantic salmon. Map of the Gulf of Maine Region showing the temperature departure from normal, averaged over December 2016 to February 2017. Temperatures were above normal across the entire region. 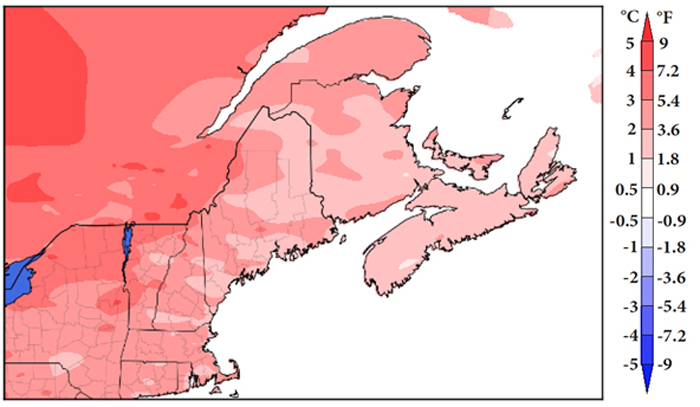 Most of the Maritimes and eastern Maine generally averaged 1°C to 2°C above normal. Northern New Brunswick and the rest of New England generally averaged 2°C to 3°C above normal. Map Government of Canada 2017. Striped Bass are a New England native. We New Englanders fish for them in Massachusetts and off Rhode Island, Connecticut and Maine shores. Cape Cod is prime Striper fishing grounds and I have enjoyed fighting them on a fly rod there, at the mouths of creeks flowing into the sea. 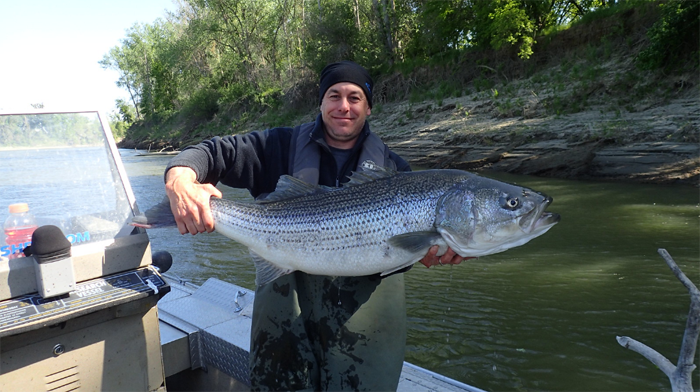 But now, the striped bass have invaded the north. Warming waters and the lure of food first brought them to the mouths of New Brunswick rivers. There they waited and attacked and ate the salmon parr making a run for the sea. We fishermen did not dream that they would follow their prey upriver. They did so, and a new invasive species was born. Forty miles inland; Stripers everywhere; not a salmon in sight. I am in mourning. 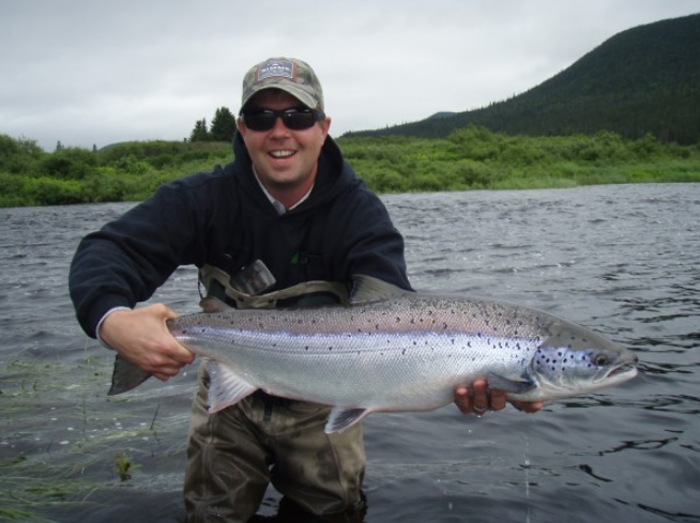 I came to Atlantic salmon fishing late in life. Soon after I retired and moved to New Hampshire, Rob, an old hunting partner of mine, invited me to the Northwest Miramichi. He showed me pictures and told me stories and like a well-hooked salmon I ran off line getting to Orvis and mail-ordering salmon flies from Doak’s Fly Shop in New Brunswick. Phone calls, discussions over good bourbon, emails, packing lists, checks written, checks mailed and one day in mid-August we were on our way, driving through New Hampshire and Maine to New Brunswick. This bad boy would devour a pool of parr in one sitting. Photo courtesy of FISH BIO.